The year is coming to an end! Time to participate in some amazing events and gather great rewards! First of all, you can try your luck with the Lucky Dice! 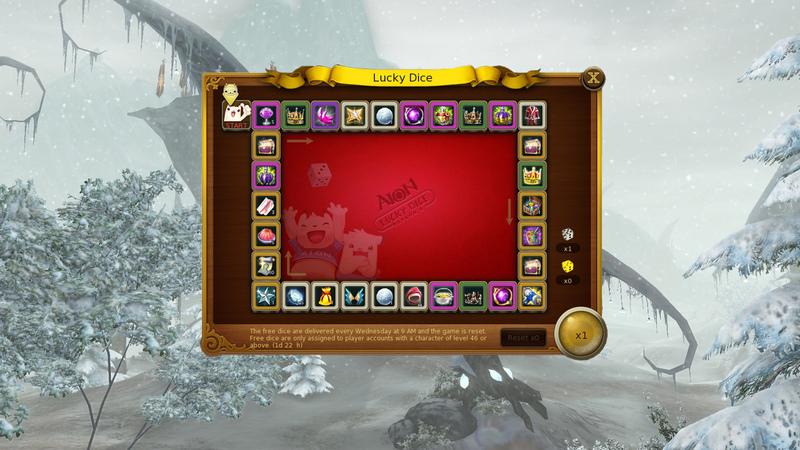 Press the golden die icon to open a game and roll the dice for valuable items like the Solorius Costume, the Snowflake and more! As long as you have a 65+ level character you will be given one die each week! Each die lets you move from 1 to 6 fields on the game board. When you land on a field, you get the correspondent prize! Each from the four available boards resets every Wednesday. Additionally, you can get free tokens daily from the in-game shop. You just need a 30+ level character. Alternatively, you can feed some Hungry Magpies! Evil scholars in Atreia are letting them starve! Show them what are Daeva capable of and earn some amazing prizes like the New Year Wings, the [Event] Legendary PvP Enchantment Stone and more! Complete the required quests and gather 10 [Event] Cocoa Fragments to feed the hungry ones! Evil scholars appear every 5 to 10 minutes; defeat them for a chance to get a fragment and XP! What is more, the evil scholar leader will appear at 8 PM on set dates and in specific locations; defeat him and get additional rewards! Finally, you can join the Snow in Atreia event and let the Snowflakes enchant you! These are not just frozen water, they can grant you fabulous rewards like the [Motion Card] Ice Skate, the Solorius Festival Floral Crown and many more! To get them, you can visit Snorinerk by the Solorius tree in the capitals and get two per day. Also, you can get some extra Snowflakes from the in-game shop or by defeating bosses in specific instances. Double-click on a Snowflake; it will either increase in level or it will be destroyed. If the latter happens, you will get a Crystal of Chance. Get your Snowflake to level 10 and transform it into a Snow Crystal and an Aura Fragment! In addition to these, you may get a Snow Crystal earlier, when upgrading your Snowflake. Furthermore, combine the Snow Crystal and Aura Fragment together and you’ll receive a Prisma. This is a rare bundle containing a valuable item. Also, for every 10 Crystals of Chance, you can get a Snowflake!